In this article we will use http transport to receive data. You can either receive or post data, in our example, we will look into http inbound endpoint. It internally uses the GET method to return data from a request-response inbound endpoint. 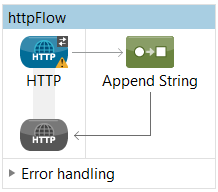 We will add <http:inbound-endpoint> as the message source in the flow to configure the http inbound endpoint. An inbound HTTP endpoint exposes a service over HTTP, essentially making it an HTTP server. HTTP/S endpoints are synchronous by default, so you do not have to set exchange-pattern=”request-response” but we still have specified exchange-pattern for clarity sake. We will send a message to the endpoint and expect a response from the flow. We can either use host, port and path attributes to specify the individual components, host server to which the HTTP must connect, the http server port and the location in the host domain. Alternatively we can also use the address attribute which is what we have done here. In this example, we will simply start an HTTP server accepting requests on http://localhost:8888/someRequest. The appender message processor appends the string ” received”. In the below example, we now make a client invocation of an HTTP endpoint. This was an example about http inbound endpoint.